Divers search the Lower Neches River Authority canal under Highway 69 near Plant Road in Beaumont on Saturday, March 29, 2008. A woman witnessed a white male jump off the bridge. Fire department officials searched the canal with seven divers because they felt the call was credible. No body was found. 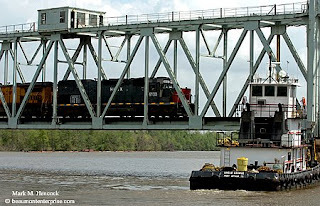 The Uncle George of Port Arthur (right) waits on a train to pass before the Beaumont bridge can be raised to allow passage on the Neches River near Riverfront Park in Beaumont on Friday, March 28, 2008. Port Arthur homeowner Julius Mathias talks about the east Port Arthur neighborhood, which has suffered an increase in drive-by shootings, in Port Arthur on Thursday, March 27, 2008. 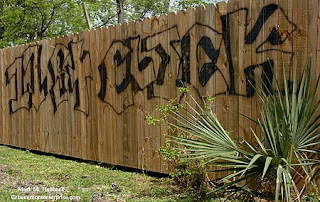 Graffitti remains on a new fence at Julius Mathias' property in east Port Arthur. Port Arthur homeowner Julius Mathias talks about the east Port Arthur neighborhood, which has suffered an increase in drive-by shootings, in Port Arthur. 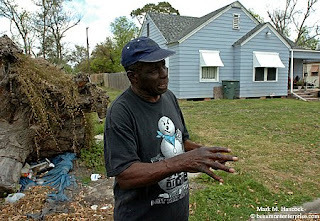 Mathias, a retiree originally from Trinidad, is considering selling the home and returning to the Caribbean island. 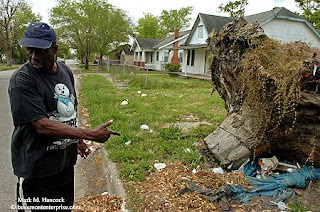 Please read, "Drive-by shootings rattle Port Arthur residents" by Fred Davis. Memorial Hermann Baptist Hospital registered nurse Cheryl Sadler cares for a baby in the neonatal unit at the hospital in Beaumont on Wednesday, March 26, 2008. 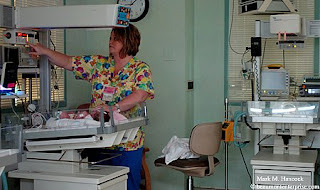 Memorial Hermann Baptist Hospital registered nurse Cheryl Sadler cares for a baby in the neonatal unit at the hospital. A recent study determined babies born early have a higher childhood mortality rate and are more likely to be childless adults. 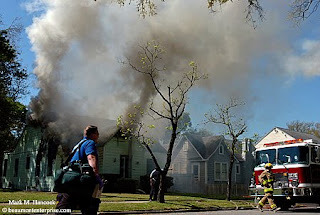 Beaumont firefighters battle a blaze at a home in the 2500 block of South Street in Beaumont on Tuesday, March 25, 2008. Police said the fire began after a man attacked his mother with a machete while she was lying in bed. Beaumont firefighters battle a blaze at a home in the 2500 block of South Street. The injured 72-year-old woman* forced her son, 49*, from the bedroom and locked the door. Capt. Earl White said fires were set in two locations in the house. White said the man could face arson charges carrying up to a 20-year prison sentence and $10,000 fine. 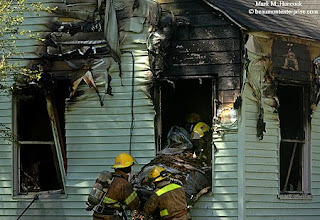 Beaumont firefighters pull a burned bed from a home in the 2500 block of South Street. The mother needed emergency surgery for defensive cuts on her arms and chest. The son suffered burns over 50 percent of his body and was flown to Galveston, where he was listed in critical condition. 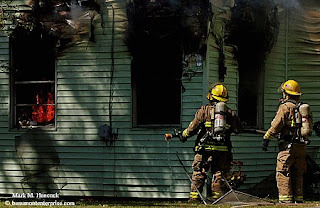 Please read, "Son is accused of arson and machete attack" by Dee Dixon and Paul S. Martinez. * No names on this story until the police file charges. The Wetland Walkway on the Sabine National Wildlife Refuge near Hackberry, Louisiana had its official reopening on Wednesday, March 19, 2008. 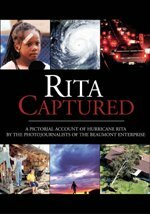 The refuge was destroyed by Hurricane Rita and required major reconstruction. 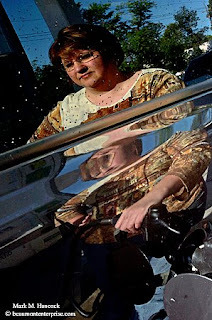 Debbie Carpenter of Beaumont fills her tank with fuel at Johnson's Shell in Beaumont on Thursday, March 20, 2008. A recent report indicates more people are using regular unleaded instead of premium fuel as gasoline prices increase. Jonathan Hancock, my nephew, momentarily loses his grip a 5'9" alligator he pulled from a pond during a Gator Grabbin' Contest at Gator Country in Fannett, Texas on Saturday, March 22, 2008. Hancock won the largest gator category of the contest. It was his first time trying to catch alligators. 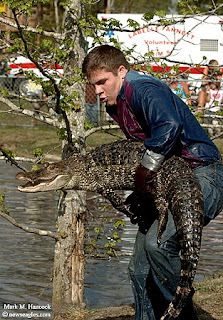 Jonathan Hancock catches a 5' 9" gator during a Gator Grabbin' Contest at Gator Country in Fannett, Texas on Saturday, March 22, 2008. Hancock won the largest gator category of the contest. It was his first time trying to catch alligators. My brother found out Gator Country would have its last Gator Grabbin' Contest this weekend. He registered himself and his youngest son for the competition. Neither have tried to catch gators before. Since it was Easter weekend, we needed my sister here as well to make it a family reunion. We expected my brother and nephew to get chewed on and get a once-in-a-lifetime story. We thought one might possibly catch a baby gator. Nobody expected my nephew to reach into a blind gator den and pull out the biggest gator of the competition. My nephew spent most of his spring break in Katy competing in a robot challenge sponsored by NASA. His next adventure is to travel to Miami to defend his team's high school National BattleBot Championship title (here's a cool video [not mine] of the bot in action). They expect to win again this year and destroy every other robot in the competition. 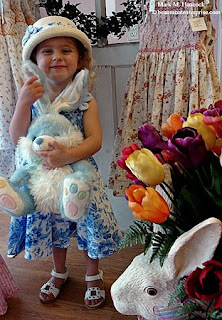 Lila Oxford, 3, of Beaumont poses for a portrait at Gigi's A Children's Boutique in Beaumont on Tuesday, March 18, 2008. 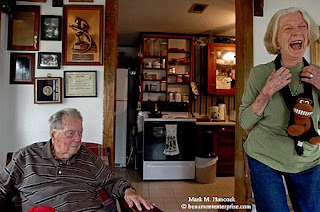 Aubrey Dixon, 91, (left) is entertained by his wife Betty Dixon (right) at their home in Mauriceville on Thursday, March 13, 2008. Aubrey Dixon, 91, (left) reflects on his life as a WWII and Beaumont Fire Department veteran at his home. 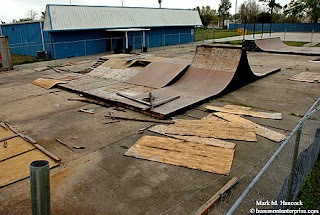 The outside skating area of the Bridge City Skate Park remains in disrepair at the park in Bridge City on Tuesday, March 18, 2008. 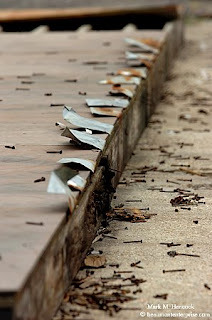 Nails, screws and rusted metal litter the outside skating area of the Bridge City Skate Park in Bridge City. Bridge City residents plan to address the city council over noise levels and parking issues from weekend concerts in the building. Neighbors and city officials went to the council meeting ready for a battle. Instead of a battle, the owner said he'd close the skate park and clean up the property. 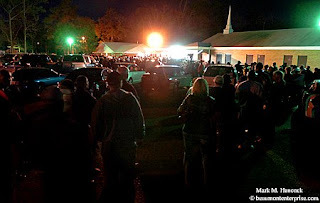 Please read, "Bridge City Skate Park wipes out" by Robert Hankins. 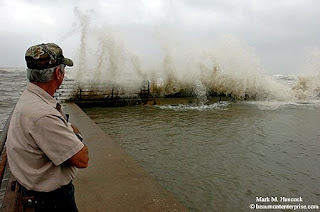 Buddy Self of Vidor watches as waves break over the end of Rollover Pass on the Bolivar Penisula on Tuesday, March 18, 2008. A coastal flood statement was issued for areas in Southeast Texas. The expected storm moved north and spared Southeast Texas while flooding areas in North Texas. Lamar University's Lady Cardinals advanced into the semi-final and championship games of the Southland Conference Tournament against Corpus Christi at the Merrell Center in Katy. 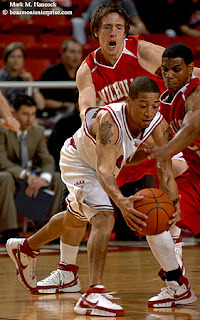 Their post-season run ended when they lost the championship game to UT San Antonio on March 15, 2008. People in this slideshow include (in order of appearance): Lamar's Nikki Williams (No. 10), Corpus Christi's Shaye Montgomery, Lamar head coach Larry Tidwell, Lamar's Tamara Abalde (No. 22), Corpus Christi's Adrienne Scott (No. 44), Lamar's Brittney Williams (No. 34), Millie Hoyal of Vidor, Lamar's Aida Bakhos (No. 13), Lamar's Trashanna Smith (No. 25), UT San Antonio's Monica Gibbs (No. 33), UT San Antonio's Amanda Foster (No. 24), UT San Antonio's Amber Gregg (No. 10), Lamar’s Emily Spickler (No. 4), and Ashley Crawford (No. 12). Acorn Steel owner Bill Ladd talks about the scrap metal and his business' place within the industry at the business in Beaumont on Wednesday, March 12, 2008. Like all commodities, steel prices have soared this year. 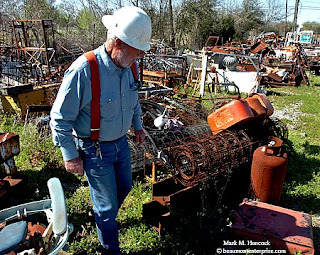 Acorn Steel owner Bill Ladd walks through rows of previously used metal objects at his business in Beaumont. 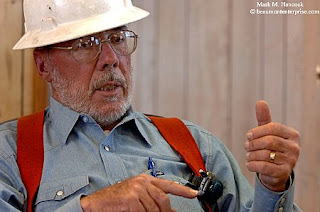 Ladd said he likes to think of his business as an industrial-strength garage sale. Rather than immediately melting scrap metal items, he lets customers give the items a second life for the cost of the metal. 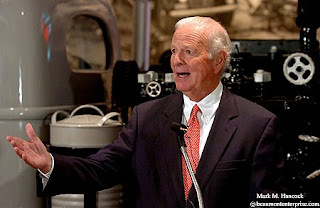 Former secretary of state James A. Baker III speaks at the Texas Energy Museum in Beaumont on Thursday, March 13, 2008. 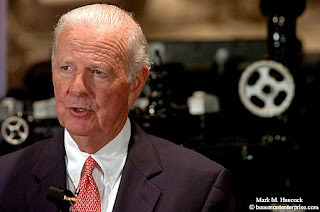 Former secretary of state James A. Baker III speaks at the Texas Energy Museum. Baker was secretary of the treasury under President Ronald Reagan and secretary of state under President George H.W. Bush. Tommy (from top to bottom), Hannah and Diana Read of the band Judas Feet pose for a portrait at The Logon C@fe in Beaumont on Wednesday, March 12, 2008. 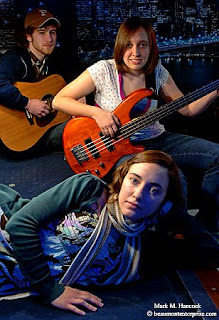 The Indie band from Silsbee features the three siblings and performs folk and Americana music. Doctors and other medical professionals in the Beaumont area gather to relieve stress by playing rock music in a studio above a three-car garage (3CG). The 3CG band performs a jam session of blues. Music has three copyrights. They are: the composer, the performer and the production company. For music videos, the VJ holds the fourth copyright, but is subject to the first three. As new VJs ask around, they might hear about the "20-second rule." There is no such rule for individuals or businesses (including newspapers). I won't say what it equates to in the real world, but we'll say a lot of folks get babies by applying a similar fictitious rule. IF - and only IF - a radio or TV station has all the proper ASCAP record-keeping and payment processes in place, they can use 20 seconds (or more). Since ASCAP licenses are outrageously expensive, don't expect a newspaper to pay the bill. Even if they do, it only applies to the newspaper's Web site - not to a VJ's personal site or blog. To play music, show a theater performance or even a specific choreography routine, it must be original and a VJ needs the composer's AND performer's permission (preferably on tape). Then, the VJ becomes the de facto production company (if sound is live) and also retains the shooting copyright. When a band only performs covers of other people's work*, VJs can ask the band to play "Blues in B." Almost any band can play this. It's the standard jam-session song. It doesn't step on any copyright and actually lets the performers shine. This isn't foolproof because one of the players could start playing something from another band, but it's the best we can do without taking years of music lessons and law courses. * If the performers cover Bach, you're OK. We're talking about contemporary pieces from the last 70 years. If music is playing in the background at an event, I've read it isn't a problem to record natural sound while covering news (this might be the infamous 20-second rule). This applies to situations such as festivals and other events where VJs have no control over the sound system. However, adding music after-the-fact as background is still forbidden unless the VJ has appropriate licences. 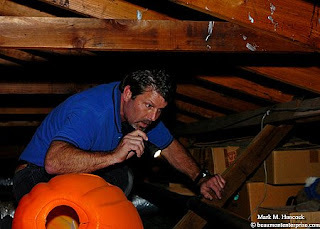 Wes Abbey with National Property Inspections checks the attic of a home in Beaumont on March 6, 2008. It's important to hire an independent property inspector and be available during the inspection before buying a home. Tyler and Lindsay Briggs (left) of Bridge City talk with inspector Wes Abbey with National Property Inspections (right) as Coldwell Banker real estate agent Dana Johnson (center) locks a home in Beaumont. The Briggs want to buy their first home. Coldwell Banker agent Dana Johnson (from left to right) explains purchase paperwork to Lindsay and Tyler Briggs of Bridge City at a home in Beaumont. The Beaumont housing market is currently running counter to national trends. Lindsay (left) and Tyler Briggs (right) of Bridge City officially sign for their home in Beaumont. The Briggs bought the home and took advantage of a first-time buyers incentive. Rob Hare (from left to right), Vickie May, Bobby Kelley and chief cook Den May pose for a portrait in Silsbee on Friday, March 7, 2008. 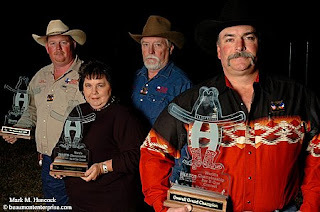 The Hardin County 'Go Texan' Bar-B-Que Team won grand championship with their ribs at the Houston Livestock Show and Rodeo Barbecue Cookoff. The win allows the team to compete in the 2008 Jack Daniels World Championship Barbecue Contest. Please read, "Hardin County team..." by Julie Shehane. Lamar's Currye Todd (No. 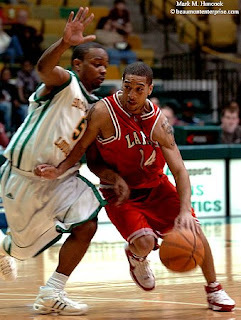 31, left) tries to make it to the hoop past Southeastern Louisiana's Kevyn Green (No. 3, right) during a basketball game in Hammond, La. on Saturday, March 8, 2008. Lamar's Kenny Dawkins (No. 14, right) works his way past Southeastern Louisiana's Dekyron Nicks (No. 5, left) during a basketball game in Hammond, La. Lamar started the game positioned to win the conference title outright for the first time since the 1983-84 season. Lamar's Currye Todd (No. 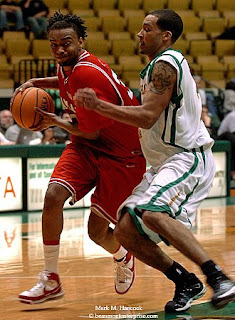 31, right) defends against Southeastern Louisiana's Daryl Arnold (No. 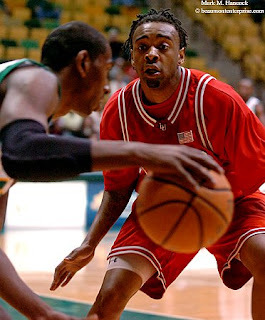 20, left) during a basketball game in Hammond, La. If Lamar could win, they'd have an automatic berth in the NIT tournament. 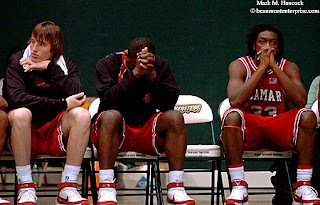 Lamar's Coy Custer (from left to right), Lawrence Nwevo and Lamar Sanders watch the final few minutes of a basketball game against Southeastern Louisiana in Hammond, La. Lamar University lost the game 83-73, but tied with Stephen F. Austin University to be Southland Conference co-champions and advance into the SLC Tournament. 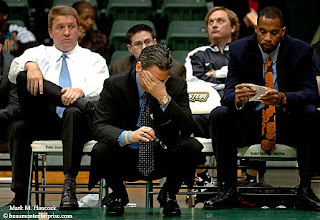 Lamar's head coach Steve Roccaforte (center) along with assistant coaches Don Skelton (left) and Kermit Holmes (right) react to a referee's call during a basketball game against Southeastern Louisiana in Hammond, La. on Saturday, March 8, 2008. Lamar University must now win three games in four days to advance to the NIT Tournament. Please read, "Missed shots..." by Perryn Keys. 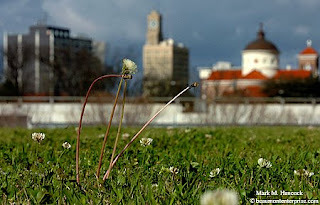 Weeds bloom near College Street outside downtown Beaumont on Friday, March 7, 2008. Spring means the beginning of allergy season. 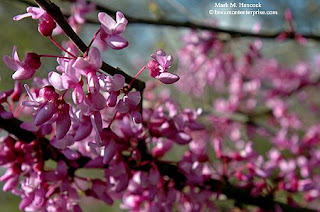 Redbuds blossom at Tyrrell Park in Beaumont. The mild winter of 2008 equates to higher pollen counts and more mold in Southeast Texas. It also means more headaches for people with seasonal allergies. Please read, "Pollen count in sneezy Southeast Texas expected to be worse than national levels" by Rose Ybarra. Lamar's Kenny Dawkins (No. 14, right) eyes the ball and gets an arm in the neck after batting down the ball from Nicholls State's Justin Payne (No. 5, center) as Lamar's Darren Hopkins (No. 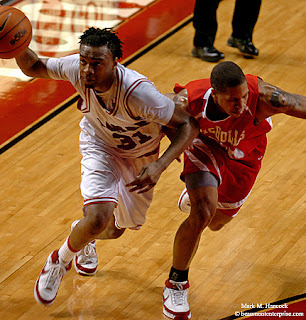 21, left) runs to get the ball during a college basketball game at Lamar University in Beaumont on March 6, 2008. Lamar's Currye Todd (No. 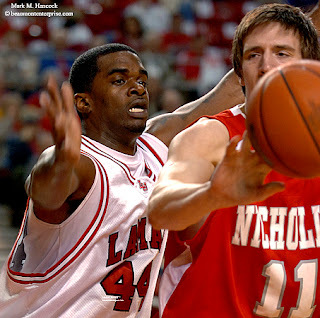 31, right) aims at the hoop while Nicholls State's Anatoly Bose (No. 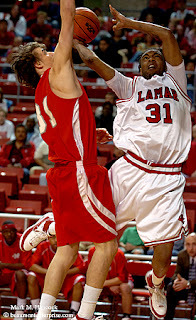 31, left) tries to block during a college basketball game at Lamar University. Lamar's Tristan Worrell (No. 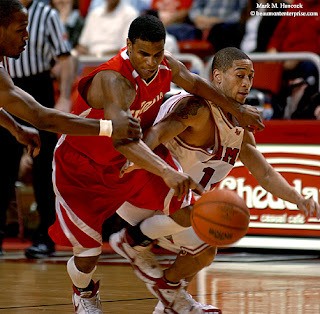 44, left) tries to swat a pass from Nicholls State's Dominic Friend (No. 11, right) during a college basketball game. Lamar's Kenny Dawkins (No. 14, bottom) recovers a loose ball from Nicholls State's Justin Payne (No. 5, right) as Dominic Friend (No. 11, top) watches and yells. Lamar's Currye Todd (No. 31, left) tries to keep the ball in bounds as he tangles with Nicholls State's Adonis Gray (No. 20, right) during a college basketball game. Lamar won the game 84-67 and looks to earn the No. 1 seed into the playoffs. Please read, "Lamar one win away..." by Perryn Keys. 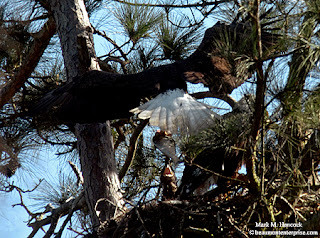 A fledgling bald eagle open its beak as a parent arrives with a fish in Orange County on Wednesday, March 5, 2008. The eagles have returned to their traditional nest near FM 105. Audubon Society officials said the eagles have built up the nest for more privacy and may move if too many people visit the area. A pair of bald eagles have returned to Orange County and have two fledglings. Audubon Society officials said the eagles built up the nest for more privacy and might move if too many people visit the area. Please read "Bald eagles return to Orange County..." by Robert Hankins. 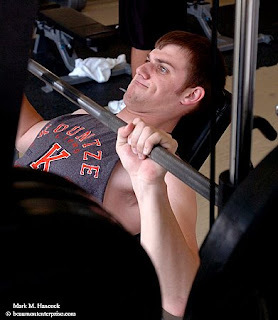 Lamar University sophomore Jon Puckett, a business major, lifts weights in the recreation center at the university in Beaumont on Friday, Feb. 29, 2008. Jefferson County Precinct 1 constable Charlie Wiggins (left) talks with deputy constable Ben Collins (right) during the Southeast Texas Chili Cook Off in the exhibit barns at Ford Park in Beaumont on Saturday, March 1, 2008. 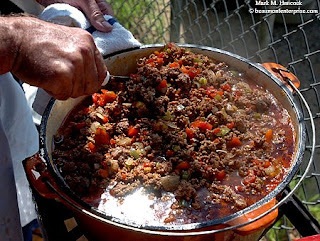 Stan Schell with the Hardin Trio chili team stirs his pot during the Southeast Texas Chili Cook Off at Ford Park. Cook off proceeds benefitted the Three Rivers Council of the Boy Scouts of America. 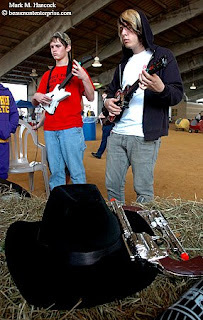 Cade Chiappetta, 14, of Lumberton (left) and Zachary Jowett, 17, of Beaumont compete in a Guitar Hero game during the Southeast Texas Chili Cook Off in the exhibit barns at Ford Park. 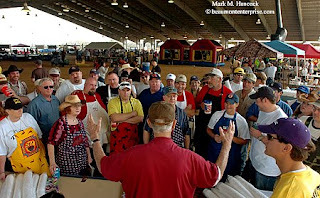 Cooks listen to chili referee Malcolm Williams of Beaumont (bottom, center) during the Southeast Texas Chili Cook Off in the exhibit barns at Ford Park in Beaumont. 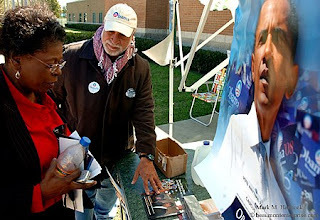 Precinct captain Curtis Sprott-Sharif (center) gives brochures to Patricia Johnson, a Martin Luther King, Jr. Middle School teacher, (left) during the Texas primary election at the school in Beaumont on Tuesday, March 4, 2008. 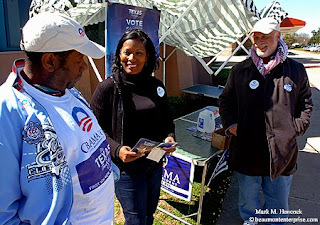 Lou Richard of Beaumont (center) talks with precinct captains Alvin Allison (left) and Curtis Sprott-Sharif (right) during the Texas primary election at Martin Luther King, Jr. Middle School in Beaumont. The results from today's Texas primary may decide the Democratic presidential nominee. William Bairamian of Los Angeles answers questions at the Clinton campaign headquarters in Beaumont. Both camps have recruited operatives from other states to secure a win. 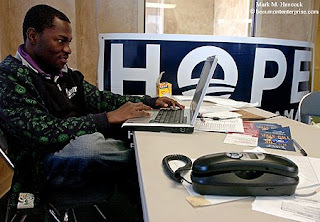 Junior Ambeau of Gainesville, Fla. helps out at the Obama campaign headquarters in Beaumont. 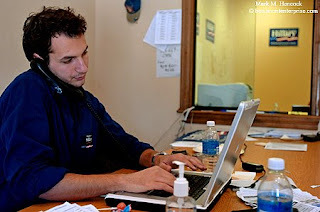 Volunteers work a phone bank to get out the vote at the Obama campaign headquarters in Beaumont. 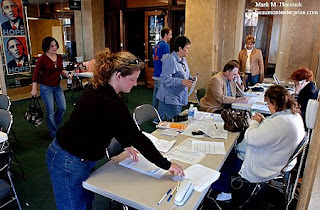 Primary elections produce 4/7ths of the Texas delegates to the Democratic party national convention. Superdelegates account for 1/7th of the delegates. A mass of Democratic voters wait to caucus at Rosedale Baptist Church in Beaumont. Although 2/7th of the state delegates come from the caucuses, they are typically a Democratic party-insider event with sparse turnout. This year's primary was different. Hillary Clinton won the Texas Democratic primary election. Locally, Barack Obama won Jefferson County while Clinton won the remaining counties in Southeast Texas. Due to the population of Jefferson County and the "Texas Two-Step," Obama actually gained more deligates from Southeast Texas than Clinton. Clinton earned four net delegates in the state-wide primary. She also has 12 pledged superdelegates to Obama's nine (14 remain uncommitted). However, Obama is currently ahead 37-30 in the caucuses (they're not all counted yet). So, after all the work and millions of dollars spent in Texas, the two candidates essentially earned zero net delegates and there's still 14 Superdelegates up for grabs. To understand what happened (and is still in play) in Texas, please read "Neither Clinton nor Obama can win enough delegates before the convention" by Richard S. Dunham / The Houston Chronicle. Please also read, "Record numbers of voters..." by Ryan Myers and "Why are voters confused about Texas primary-caucus system?" by Jemimah Noonoo.